Asana is a work management platform that enables teams and individuals plan and track the progress of projects. It helps its users stay focused on goals, projects, and daily tasks, so they can work on what matters most in their business. Since being founded in 2008, it is now being used by millions of people in almost 200 countries. And just days ago, it announced that it has raised another $50 million in funding that yielded a $1.5 billion valuation of the company. It continues to roll out new features and improvements, such as Portfolios, Sections in Timeline, a new Homepage, and more. 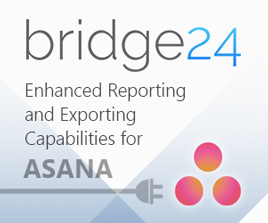 For a powerful reporting and exporting tool for Asana, give our own tool Bridge24 for Asana a try. Asana has had an active and productive 2018. Just in late January this year, it has raised $75 million Series D funding led by London-based Generation Investment Management. Last September, the PM company also announced that it has reached 50,000 paying customers, up from 20,000 in just 18 months. Generation also led the latest Series E fund round, together with other existing investors 8VC, Benchmark Capital, and Founders Fund, with new investors Lead Edge Capital and World Innovation Lab. The funds are meant for international and product expansion. The company has been focusing on international expansion lately. And the proof is that half of its new sales are now coming from outside the US. Therefore, it plans to open a new data center in Frankfurt next year. It also plans to open new offices in Sydney and Tokyo. It is hiring also in Europe and the Asia-Pacific markets. Currently, the software is available in 5 languages: English, French, German, Spanish, and Portuguese, with Japanese next in line. Product-wise, it is also adding machine learning, predictive, and other AI features. With the mission to shape “the future of work,” its long-term vision is to successfully combine computer and human intelligence to run entire companies. Initially, it is now offering services that start to anticipate what users need to see first and prioritize, based on previous behavior. In the wider world of enterprise IT, collaboration through messaging and chat applications are transforming how coworkers are communicating with each other. Cloud-based services are also changing how people in organizations are managing and collaborating on files and documents. Powerful mobile devices that have empowered people to work while on the go also increased the need for more flexible file access and management. 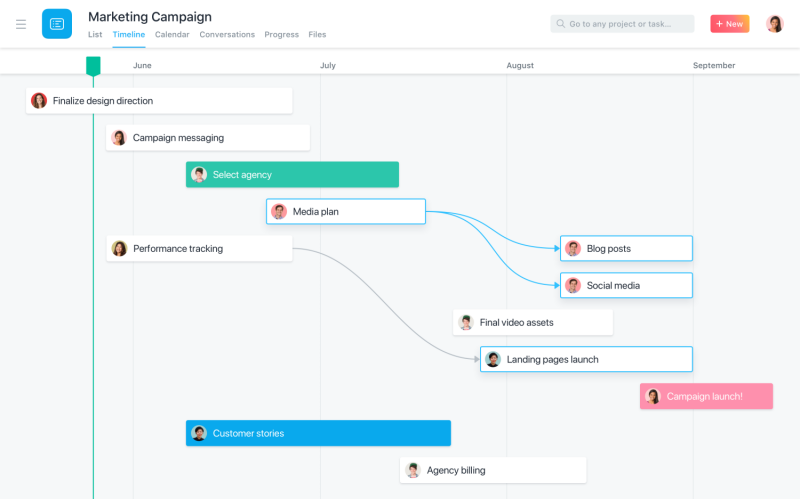 An area where Asana is making its mark is work management, a single platform where people can organize work and track all types of collaboration they are now capable of. Competitors in this area include Airtable, Wrike, Trello, and Basecamp. The company’s focus, where they intend to use some of their funds, is to continue building up big customers. Air France KLM, for example, has 84,000 employees, and its using the work management platform to manage and coordinate work across different locations and business functions. The London National Gallery uses the software to plan and launch exhibitions and business projects. Supermarket chain Tesco uses it for its digital campaigns; Sony Music, for marketing management and tracking its digitization project; and Uber for its hundreds of city expansions. Asana co-founder Dustin Moskovitz described their role during an interview. It is to help leaders understand where their attention can be most useful, and what they should be focused on. Dustin believes they have been fortunate with their investors, who matches their vision in thinking about the long-term future. Colin le Duc, Generation Investment Management co-founder and partner, sees collaborative work management as a segment that is rapidly expanding. He believes that Dustin’s team and Asana are the right team and product to lead that market segment. Asana is changing how businesses around the world are collaborating, promoting mission-driven culture to deliver results. 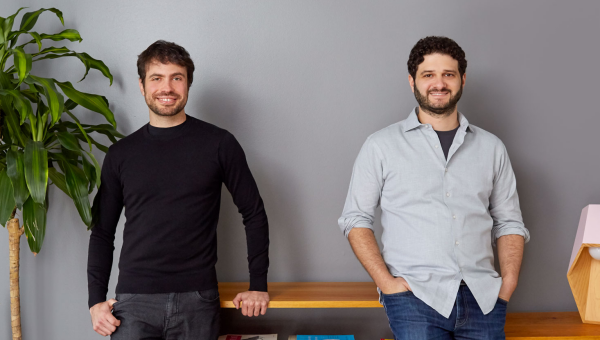 Asana founders Justin Rosenstein (left) and Dustin Moskovitz (right). To read more about the latest company announcements and new product features, visit Asana also on Facebook, Twitter, LinkedIn or YouTube.